Summer is the perfect time for learning about sea animals. And with Shark Week coming up in June, it’s the perfect time for Shark Activities and to share some of these awesome kids shark books. My son has always loved sharks. These are some of our favorite shark books that we either own or have gotten from the library numerous times. I have broken the list down into fiction and nonfiction books. Clicking the book title will take you to more information about the book on Amazon using an affiliate link. These kids books featuring sharks are perfect for snuggling up together to read. Little Shark Finger Puppet Book — Finger puppet books are a cute way to interact with your child during reading time. 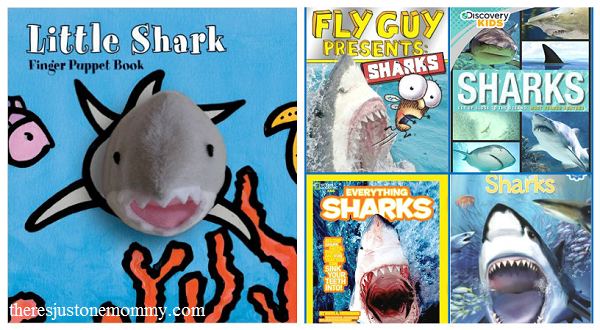 This adorable book allows even your youngest family member to get into the shark action. Clark the Shark — This is a great read aloud picture book. Clark the Shark is full of energy and is a bit too rowdy at times. In this book his teacher helps him find a way to tone that energy down a bit. Good for helping kids learn self control how their behavior affects others. Shadow of the Shark (Magic Treehouse series) — This is book 53 from the popular Magic Treehouse series. Jack and Annie are whisked off on a dream vacation to Mexico. But, that dream vacation takes a twist when a hungry shark attacks. I Survived: The Shark Attacks of 1916 — Based on true events when the Jersey shore was terrorized by Great White Shark attacks. The I Survived book series is a huge hit with kids. Each book is full of excitement, and this book is no exception. You’ll find yourself anxious to see what happens next at the end of each chapter. How to Survive as a Shark — Humorous book packed full of jokes and facts about sharks. It’s important for young readers to be exposed to both fiction and nonfiction texts. These early reader nonfiction shark books will inspire your child to learn more about these fascinating creatures. Plus, young children are excited when they can read independently about a topic that interests them. Amazing Sharks! (I Can Read book, level 2) — Perfect for early readers and filled with beautiful photographs, kids will enjoy reading about sharks in this easy to read book. Fly Guy Presents Sharks (Scholastic Reader, level 2) — The popular Fly Guy is back in this nonfiction reader which combines kid-friendly humor with the topic of sharks. Your child will be laughing and learning, a perfect combination. Sharks (Reading Discovery Nature Series, level 3) — Discover facts about the ultimate predator in this leveled reader. With 15 of the most well-known sharks featured, your child will enjoy learning something new each time they read it. Incredible Sharks (See More Readers, level 1) — Simple sentences allow early readers to easily read this level 1 nonfiction shark book. Want to know even more about sharks? The following are some of our favorite kids shark reference books. These books make it easy to learn details about your favorite sharks. National Geographic Kids: Everything Sharks — With 64 pages packed full of facts and amazing pictures, it’s everything you expect from National Geographic. We like that the pages are broken up so you can read the whole page or choose which facts interest you at the time. Plus, the index at the back makes it easy to look up your favorite shark. Sharks (Discovery Kids) — Perfect for Discovery Channel’s Shark Week! Includes information about shark habitats, behavior, and feeding habits. Plus, learn how we can help the shark population. Pocket Genius: Sharks — The small size of this book makes it perfect for taking on the go. It is full of information on over 150 different sharks and rays, including ancient sharks. The table of contents and index make it super simple to find just the shark you’re looking for. Paleo Sharks — Find out about prehistoric sharks! What did they look like? How big were they? Each shark featured has a section comparing its size to an adult human. Bonus points if you can pronounce some of the tongue-twister names in the book. Sharks and Other Predators: A Non-Fiction Companion to Magic Treehouse #53 — Perfect for fans of the Magic Treehouse series, or anyone wanting to learn more about sharks. This nonfiction Fact Tracker is full of information, pictures and fun tidbits from Jack and Annie. Mixing facts about sharks with coloring, puzzles, and stickers makes learning about sharks even more fun! National Geographic Kids Shark Sticker Activity Book — This activity book is packed full mazes, games, and facts about sharks. So much fun the kids won’t even know they’re learning. Scholastic Sharks Sticker Book — This activity book contains colorful pages full of shark facts and jokes, plus 260 stickers for your child to place on the pages. We love the jokes in the thought bubbles from the sharks and fish. Sharks of the World Coloring Book — The detailed pictures in this book are perfect for kids as well as shark-loving adults. There are 25 different species of sharks to color, each accompanied by a fact-filled caption. There is also a double-page illustration of all the 25 species drawn to scale, helping kids better understand how big that Great White Shark is compared to the small Cookie Cutter shark. Whether you’re looking for books that your own shark fan will enjoy, or you’re looking for books to help celebrate Shark Week, these kids shark books are some of the best. Great collection of shark books. I hopping by from the #shinebloghop. Have a great day! This post has the best title ever! Thanks so much for sharing this at Booknificent Thursday on Mommynificent.com!